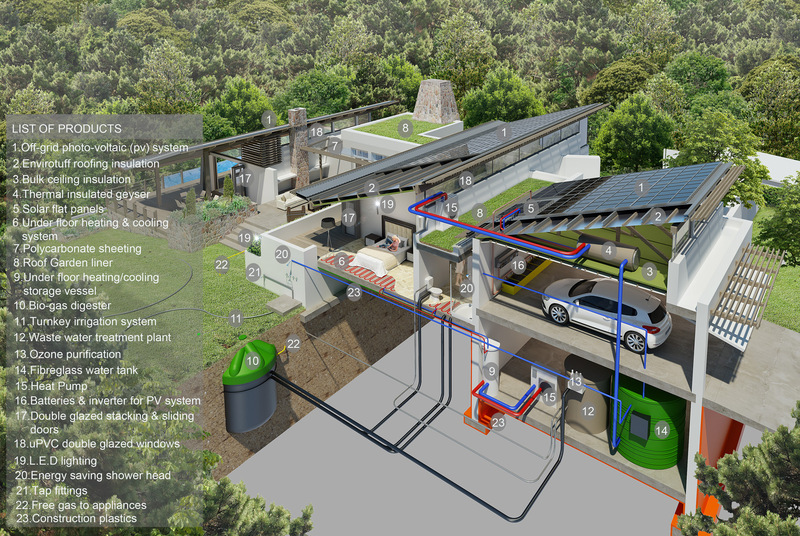 House Rhino will incorporate a comprehensive array of energy and water efficiency solutions. The design will include several alternative energy solutions including solar photovoltaic panels used together with MPPT regulators, inverters and deep cycle battery banks that will enable the house to be fully off grid. The hot water heating will all be done with solar heating systems backed up by heat pumps for the low radiation days and all water stored in fully insulated solar geysers. All rainwater will be harvested and stored in more than 30 000lt of tanks; this water will be treated making use of ozone treatment before being used for drinking and bathing water in the house. All black water will be treated in a bio-digester together with all organic kitchen waste as well as grass cuttings that will create all cooking gas for the home, the water overflow from the digester will be treated on site by a black water treatment plant and all that water will be used for flush water in the home as well as irrigation for the garden, this means the system makes use of every drop of water on site efficiently. The construction will incorporate low thermal emission double glazing on all openings as well as high performance Enviro-Tuff insulation in the roof space to optimize energy efficiency and meet all the new building regulations laid down in SANS 10400XA [New Building Regulations]. LED lighting options will be used throughout the home both internally and externally dramatically reducing the energy requirements during low light conditions. The lighting requirements in certain areas of the home will also be reduced due to natural light harvesting being incorporated into the design. The design will also feature an innovative under floor water heating and cooling system making use of solar water heating backed up by heat pumps and a 10 000 ltr heat storage tank, the water will be circulated through the reinforced concrete floor slabs and heated in the winter and cooled during the summer to maintain an optimized room temperature for the occupants. Another innovative feature is passive heating and cooling measures including a centrally positioned thermal cooling tower, as well as the thermal massing of walls and foundations helped to retain solar energy, slowly releasing stored heat at night to moderate temperature fluctuations. The use of a roof garden together with a specially designed waterproofing system incorporated into the roof garden will assist in optimizing this feature. Utilizing both active and passive ventilation systems, the building design encourages the natural circulation of airflow by allowing warm air to rise while drawing cooler air through a series of low level ventilation grills. Another air ventilation system making use of warm and cool air will also be used to improve both heating in the winter and cooling in the summer with this fresh air being ducted through the home, the air will be treated making use of an ozone air purification system that will reduce mould as well as all air born bacteria reducing sickness and allergies. Local materials such as dry packed stone and recycled alien timber such as blue gum are used throughout the building, offsetting the overall carbon footprint of the building by reducing the need to import materials to site. A number of advanced technologies will also be featured such as a fibre-optic data communication network which will be supplied to every home on Crossways allowing high-tech infrared cameras and security systems to be installed to maintain security across the full estate using all the latest technology. Smart metering systems for all electrical meters providing each home the ability to make use of power or sell it back into the local Crossways grid will be installed as well as smart meters for both the drinking water connection to each home and the treated water that will be used for garden irrigation. The systems will all be monitored by a central CFV Utilities company to ensure optimal use and efficiency as well as control the state of the art security system. The CFV utilities company will also be responsible for managing the overall efficiency of the development including a sophisticated waste water treatment and wetland system, composting and solid waste processing centres. House Rhino, designed by CMAI architects together with the Rhino Group, was designed to demonstrate and prove the efficiency and effectiveness of the various integrated energy systems, and will be gauged on an on-going basis serving as a tangible benchmark for the measure performance of the design. The information gained will be made available to all future home owners in Crossways to utilize in the new homes when they start building. Through these bold and adaptive steps House Rhino will ultimately strive towards the creation of a sustainable tomorrow which will not only substantially reduce our overall carbon footprint but serve to create a more economically viable environmentally friendly and energy efficient project with long term benefits for a healthier more conscious lifestyle of the future.